TVA’s shortsighted plans to drill into our aquifer could threaten our future. Really. When I was enrolled in university, my political science courses discussed future conflict and migrations resulting from water scarcity. I did not think that I would see evidence of this so soon after graduation. 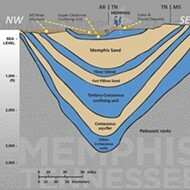 A government geological study notes that there is a major cone of depression in the Memphis area as a result of long-term pumping of water at municipal and industrial well fields. This problem is in addition to the $615,000,000 lawsuit from Mississippi against Tennessee challenging the intense pumping of aquifer water in Memphis. This pumping has allegedly caused a depression in the Mississippi water table and altered the direction that water moves underground. This issue of our water aquifer is not a fad of environmentalism, nor is it a fund-raising platform for the Sierra Club. This is the kind of issue that will come to define our era, and Memphians are at the forefront of it in a very real way. With climate change altering rain patterns and, ultimately, aquifer recharge rates, it seems foolish to blindly obligate millions of gallons of this precious resource to the Tennessee Valley Authority for its proposed use in the cooling of their new natural gas plant here. A 2015 study cited that just 6 percent of groundwater is replenished within a "human lifetime" of 50 years. The water we drink from the Memphis Sand Aquifer is 2,000 years old. Let that sink in. While water may be a renewable resource, it is finite in quantity and vulnerable to contamination. Brian Waldron, a researcher at the Ground Water Institute, has warned, "We don't really know the rate at which the Memphis aquifer is replenished, nor do we know what the potential is for water degradation." So it is that citizens of Memphis — across party lines and socio-economic statuses — have become seriously concerned about the risk of contamination at the forthcoming TVA natural gas plant, where five newly drilled wells are located in near proximity to an unlined coal ash pond. TVA needs independent, scientific experts to define the risks associated with groundwater contamination and to map the holes in the protective clay layers. We must insist that the TVA look at other alternatives, ones that do not commit our drinking water towards the maintenance of fossil fuel infrastructure for decades into the future. And let's stop pretending that this gas plant is the greatest thing since sliced bread. Yes, it will be be an improvement over the coal plant that currently services (and pollutes) our region. But TVA did not decide to make this change out of the goodness of their progressive hearts. Rather, they engaged in a consent decree with the Environmental Protection Agency, which alleged Clean Air Act violations at 11 coal-fired plants. The natural gas plant is but a Band-Aid, not a long-term solution. Natural gas these days is extracted through the process of hydraulic fracturing (fracking) via chemicals injected into the earth at high pressure. This process uses a startling amount of clean water, and it risks contaminating nearby groundwater in the area where extraction occurs. 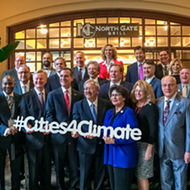 Climate change, the overriding issue here, is a real and urgent global crisis with tangible economic consequences. At the time of TVA's creation in the 1930s, the agency was envisioned as a utility provider — but that's not all. It was also created to be a regional economic development agency, tasked with using federal experts to modernize the region's economy and society. We are still in need of this grand vision and worthwhile mission. We need the leaders of our nation's largest public power agency to take action to protect our natural resources, our health, and our economy. And we need an energized and mobilized citizenry ready to demand the protection of our natural resources and the development of renewable energy for this region within the foreseeable future. The fact that we do not have such a plan in place and yet continue to build infrastructure for a volatile and controversial fossil fuel industry is unacceptable. When I voice these concerns to my elected officials and those in the industry busily conducting business as usual, I receive patronizing responses that dismiss my sense of urgency. "We have enough drinking water to last another 50 years," they say, causing alarm bells in my mind to sound loudly. In 50 years, I should be enjoying retirement, not fighting water scarcity. So, consider this an open invitation to everyone who drinks water, to our scientific community, and to the public and private leaders within our region: You either represent the future or you represent the past — but the status quo will not stand. Plug into the Protect Our Aquifer movement and help protect our community's greatest resource. Jenna Stonecipher is a former appointee of Shelby County government and current board member for Protect Our Aquifer.